Tired of having to fumble around with, and keep track of loose driver bits? 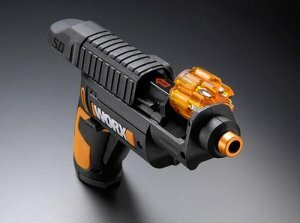 Worx took the technology of two handgun types and came up with a way to make changing bits hassle free. It looks pretty cool too. The AD SemiAutomatic Driver is a new cordless tool from Worx that uses a revolver style cartridge to store 6 driver bits onboard the tool. Using an action like a semi-auto pistol, the AD SemiAutomatic Driver changes out the bits the same way a gun would chamber a round. The driver is powered by a 4-volt lithium battery that can hold a charge for up to 18-months, but it does take 5-hours to charge. It is no surprise the drill is not very powerful - delivering 27in-lbs - but small lightweight tools like this are popular for light duty work and Swedish furniture assembly. Costing about $50, the AD SemiAutomatic Driver (WX254L) includes two 6-bit cartridges, 11 driver bits, 1 drill starter bit and a five hour charger. Look for it this month in stores and online.